The organizations that conducted more than 600 protests across America against Obama and illegal immigration, July through October of 2014, are announcing a new national wave of demonstrations against Hillary Clinton in the run-up to Election Day 2016! Americans for Legal Immigration PAC (ALIPAC) and Overpasses for America (O4A) are asking American citizens who oppose Hillary Clinton or support Donald Trump to help plan and attend demonstrations on overpasses and intersections across America. The purpose of this new wave of demonstrations is to bring attention to Hillary Clinton's WikiLeaks scandals, her support for amnesty for illegals and open borders, her opposition to Second Amendment gun rights, and her highly inappropriate efforts to demonize tens of millions of Trump supporters as "deplorable" and "irredeemable." Activists may locate an event to attend or have their event listed online in two locations. "We want Americans holding American flags and pro-Trump signs where many motorists can see our support for Donald Trump's campaign and our opposition to Hillary Clinton's efforts to keep the failed DC establishment in power," said James Neighbors, Spokesman of Overpasses for America. "On Election Day November 8, we want all of our demonstrators to go to their polling locations with their signs to speak with voters about what a disaster a Hillary Clinton Presidency would be!" All Americans that support secure borders, immigration law enforcement, America's police officers, soldiers, veterans, and Donald Trump are asked to attend and to bring video recording phones and camcorders to document these efforts and share them online using social media. Demonstration videos and pictures, including any aggression or violence from Hillary Clinton supporters, should be posted on the Overpasses for America Facebook page (click here to view) or emailed to WilliamG@alipac.us. "The corrupt biased media and Hillary Clinton's campaign are encouraging and even employing people to violently attack Trump rallies, Trump supporters, and Trump signs. This kind of leftist aggressive and deceptive rhetoric is also responsible for the murders of our police officers," said William Gheen, President of ALIPAC. "It is time for all Americans who value America's Constitutionally insured freedoms and civil rights to stand together against the bloody defamation and libel being directed at Donald Trump and his supporters. We must stand against the biased corporate media and the campaign of Hillary Clinton!" Other peaceful and racially inclusive pro-America organizations and leaders are encouraged to join this effort as many Americans will need to be at the polls on Election Day Nov 8 to help document and defend against election fraud efforts planned by the Democratic Party, BLM, La Raza Groups, Black Panthers, SEIU, etc. 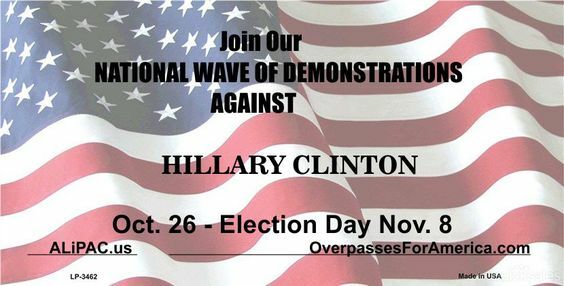 This new wave of national demonstrations against Hillary Clinton kicks off today from 4-7pm ET on the overpass located at the intersection of Six Forks Rd and I-540 in Raleigh, NC, where William Gheen will join local activists. James Neighbors will personally lead the demonstration in Mustang, Oklahoma. For more information or to schedule interviews, please contact William Gheen at WilliamG@alipac.us or (866) 703-0864 and James Neighbors at overpasses@gmail.com and (405) 788-0266. Last edited by ALIPAC; 10-26-2016 at 12:46 PM. nomas and artist like this. If Trump carried NY there are 29 electors. Those are the battleground states, but we want demonstrations in all states including deep blue CA, Oregon, Washington, and especially the must-win state of Florida! I was out this morning for 1 1/2 hours sign waving. I keep spreading it on The Deplorables FB page. Oregon could go for Trump if conservatives would work on getting out the vote. Same in a lot of states.